Auto Shield offers complete protection for your car’s paintwork and interior surfaces, providing a shield against common problems such as paintwork fading and discolouration, damage from bird droppings, and more. And let’s not forget about the benefits that it provides for your interior surfaces – nourishing your leather seats, helping reduce cracking of vinyl surfaces, and protecting your fabric and carpets from commonly consumed foods and liquids seeping through the surface. 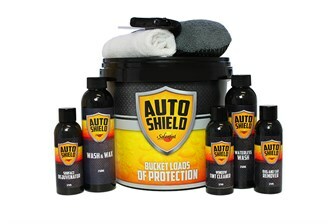 What’s great about Auto Shield is that with every purchase of an exterior/interior pack, you’ll receive a FREE reward kit to help maintain your vehicle’s showroom shine. So a bucket-full of goodies that gives you all you need to shield n’ shine your paintwork and interior surfaces.